Can a restored façade bring a Vermont town back to life? When she undertook the task of re-creating the art deco façade of the now-decrepit Springfield Theater, Leslie Fry had two photographs to work from. In one image, taken from the side in 1950, the central concrete mask of Comedy is smiling warmly above the marquee, the corners of its mouth elongated like a joker’s. In the other, taken in the same year, the mask’s smile appears sinister: It peers from behind the marquee as if waiting to attack. Looking back and forth at the two pictures all summer, Fry says, she felt totally schizophrenic. “These photographs were driving me crazy in the beginning,” says the artist, who splits her time between Winooski and Florida. With so little evidence to go on, why bother creating an exact replica? It’s not as if many Springfield residents remember how the theater looked in its heyday. The grand relief was covered up in the 1950s, and might have remained under wraps had the building not been badly damaged in a fire two years ago. But the theater means a lot to the people of Springfield. It’s been a source of entertainment in the Upper Valley since it opened in 1931 — a constant in a downtown that never recovered from the loss of its once-thriving machine-tool industry. Oh, and in 2007, the theater got famous with a little help from everyone’s favorite Springfield residents — the Simpsons. The town beat out 13 other Springfields around the country with its video tribute to the TV show. It was named the official “Home of the Simpsons,” and that little two-screen theater hosted the world premiere of The Simpsons Movie. Fry’s work is only a portion of the $3.5 million restoration, a joint effort of Housing Vermont and the Springfield Housing Authority. In addition to renovating the building to accommodate three movie screens — including one for 3-D — the partnership is building nine apartments above and beside the theater. Bill Morlock of the Springfield Housing Authority says the work should be done by the end of April 2011. Stepping into the Chamber of Commerce, visitors are welcomed by a massive yellow arm that rises from the floor clutching a donut with pink icing. That must be Homer. The theater sits on a short block beside an accounting office and a brand-new sports bar, the entrance of which is marked with a temporary sign. Behind the scaffolding, you can see what remains of the façade: It frames two sets of double doors like a proscenium. The concrete is chipped and stained, and the mask from the photos is missing entirely. Alan Barr, who has been working with Fry on the relief, says it’s surprising the structure survived as well as it did. Barr knows a thing or two about the subject. Before moving to Vermont in 2005, he ran a business in New York City for 20 years, replicating the terra-cotta details of historic buildings. In 2002, he led the restoration of two 15-foot angels on the prow of the triangular Flatiron Building, on the occasion of its 100th anniversary. “It was a very similar kind of project,” Barr says, “with nothing to work from but photographs.” Of course there were many more images of the iconic New York building than there will likely ever be of the little theater in Springfield. The history of the building is pretty well documented, though. The two-story block was built to house a dry-goods store in 1867. It was expanded in 1884 to three stories, and in 1914, the Sparrow Amusement Company built a 370-seat theater inside. In 1931, it reopened as the Capitol Theater, a movie house along the same lines as the Flynn, which opened for business the year before. 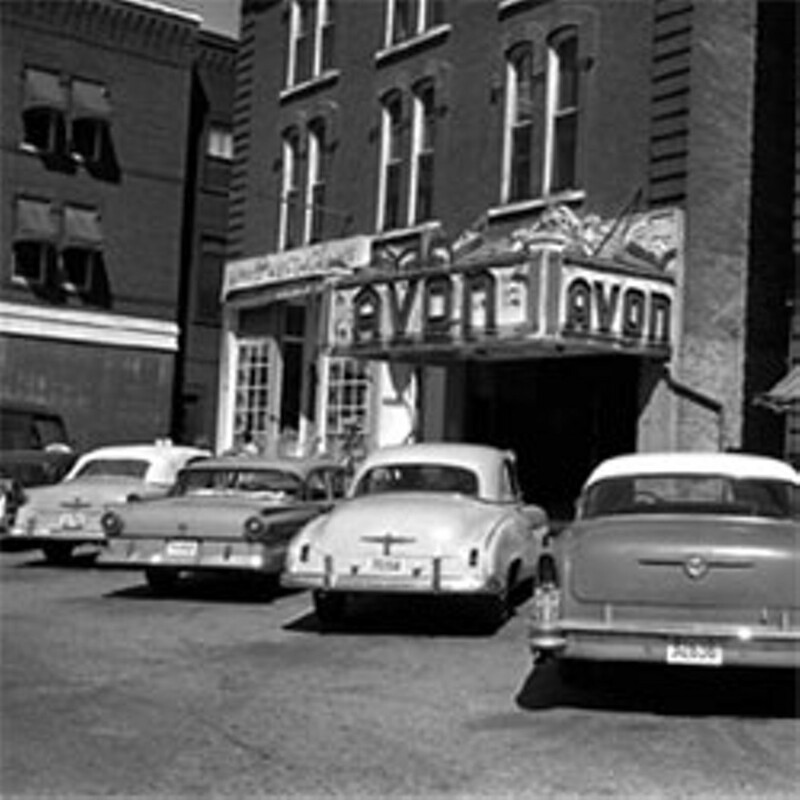 Sometime in the ’50s, the theater’s façade was covered with faux brick. “No one gave it a second thought,” Barr says. “It looked perfectly fine as a brick structure” — for the next 50-odd years. “Then, in the process of cleaning up from the fire, [workers] yanked some of it off.” That’s when they saw the history hidden underneath. “Housing Vermont got involved, and they really wanted to do justice to the building’s history,” Barr says. Fry worked in plaster over the summer to create a cast of the central portion of the relief — the part with the mask. 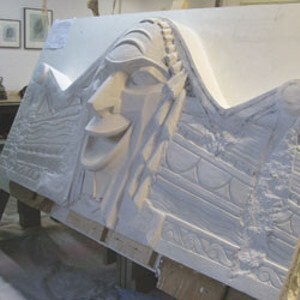 That generated a mold that can be used to remake the whole thing again in concrete. Her molded mask looks eerily similar to the one in the old photographs: equal parts friendly and menacing. The project differs from much of Fry’s past work, which came directly from her imagination, including a circle of sphinxes in Pomerleau Neighborhood Park outside the Price Chopper supermarket in South Burlington, and the mermaid jutting from a building on North Avenue in the Old North End. But in other ways, the Springfield project fits Fry to a T. Right before taking it on, she presented an installation at Barton College in North Carolina. In “Excavating Shadows,” a massive pile of individually cast objects — human heads, miniature buildings, tools, plants and animals — spilled from a wheelbarrow. Inside the wheelbarrow, a glowing screen played video footage of people growing and morphing into other objects; plants rotting and blooming again.